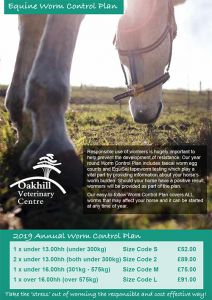 Oakhill’s 12 month, cost effective Equine Worm Control Plan plays an integral part in reducing worm burden in your horses and ponies. Responsible use of wormers is hugely important to help prevent the development of resistance to the wormers. Faecal worm egg counts play a vital part in providing information about your horse’s roundworm burden. Our easy-to-follow worming programme covers ALL worms that may affect your horse and it can be started at any time of year. Click here to download Worm Control Plan application form or complete the online form below. If you wish to place a larger order for a yard, please click here to download a yard order form. Did you know that by joining our Equine Care Plan you can save money and spread the cost of your routine care over 12 months. Some of our care plans include our annual worming programme, annual vaccinations and dental care!